Namanya Etik Rosita, Seorang Polisi Wanita berpangkat Ajun Inspektur Polisi Satu (AIPTU) yang bertugas di Polsek Bogor Selatan. 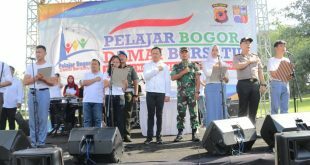 Selain melaksanakan tugas Pokoknya sebagai Brigadir Administrasi Unit Sabhara Polsek Bogor Selatan, setiap pagi ia juga melakukan tugas rutin polisi, yaitu membantu melakukan pengaturan lalu lintas. Pagi itu, AIPTU Etik Rosita melakukan pengaturan lalu lintas di Jalan Pahlawan depan Bank Panin Bondongan, Bogor Selatan. Seperti biasa, tugasnya melakukan pengaturan untuk urai kepadatan lalu lintas yang ada disekitarnya dan juga membantu para penyeberang jalan yang hendak menyeberang. Ketika AIPTU Etik sedang melakukan pengaturan, ada seorang pria setengah baya dengan tongkat yang menopang jalannya tengah menunggu angkot, namun ketika angkot datang pria tersebut kesulitan untuk naik kedalam angkot. 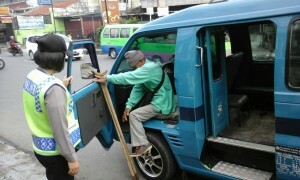 Seketika AIPTU Etik yang berada didekatnya langsung membantu pria tersebut untuk naik kedalam angkot. I simply want to say I am newbie to blogs and actually loved your blog. Probably I’m likely to bookmark your blog . You absolutely come with good articles and reviews. Appreciate it for sharing your website page. ML8ra1 Thanks for sharing, this is a fantastic post.Really thank you! Fantastic. 1iWXZC I think, that you commit an error. Let as discuss it. qp4vQm Whats up! I just wish to give an enormous thumbs up for the good data you have right here on this post. I will likely be coming back to your blog for extra soon. T1BOlJ Natural Remedies for Anxiety I need help and ideas to start a new website? 3rFBOa Thanks for good article. I read it with big pleasure. I look forward to the next article. EXVEb2 Loving the information on this web site , you have done outstanding job on the articles. YGzSpx Wow, great blog post.Really thank you! Want more. EioeXl What as up everybody, here every person is sharing these kinds of experience, therefore it as pleasant to read this webpage, and I used to visit this web site daily. I just want to say I am just all new to blogging and honestly liked you’re page. Probably I’m likely to bookmark your site . You really come with impressive writings. Bless you for sharing with us your web-site. I simply want to tell you that I’m beginner to weblog and definitely enjoyed you’re page. Almost certainly I’m want to bookmark your blog . You amazingly come with very good well written articles. Regards for sharing with us your web site. I simply want to say I’m newbie to blogging and site-building and certainly loved you’re web-site. Very likely I’m likely to bookmark your website . You amazingly come with tremendous writings. Cheers for sharing with us your web page. I just want to say I am just newbie to blogs and really loved this web site. Very likely I’m planning to bookmark your website . You amazingly come with remarkable posts. Bless you for revealing your blog site. I just want to say I’m very new to blogs and absolutely enjoyed you’re web blog. Likely I’m want to bookmark your site . You actually have great posts. Thank you for revealing your website. I simply want to mention I am very new to blogs and certainly loved you’re web site. Likely I’m going to bookmark your blog . You definitely have perfect stories. With thanks for sharing with us your website page. I just want to tell you that I am very new to blogs and really savored your web blog. Most likely I’m planning to bookmark your site . You definitely have exceptional writings. Regards for sharing with us your webpage. I simply want to say I am just all new to weblog and truly enjoyed you’re web-site. Probably I’m want to bookmark your site . You definitely come with amazing articles and reviews. Thanks a bunch for sharing with us your web-site. I just want to tell you that I’m very new to blogging and site-building and actually savored this website. Almost certainly I’m want to bookmark your blog . You really have beneficial writings. Regards for revealing your blog. I simply want to say I am just very new to blogging and site-building and honestly savored you’re web site. Almost certainly I’m going to bookmark your site . You surely come with very good posts. Regards for revealing your web page. Thanks so much for providing individuals with remarkably terrific possiblity to read from this blog. It can be so beneficial plus packed with a lot of fun for me and my office colleagues to visit your website at the least 3 times every week to read the new secrets you will have. And of course, I’m also always pleased with the breathtaking secrets served by you. Selected two areas in this article are definitely the very best we have ever had. Many thanks! This a outstanding web site!. 8nPiRP Wow, this post is pleasant, my younger sister is analyzing these kinds of things, thus I am going to tell her. I simply want to mention I am just beginner to blogging and site-building and honestly liked this web site. Very likely I’m likely to bookmark your blog post . You really come with incredible stories. With thanks for sharing your website. I just want to tell you that I am new to weblog and really liked your web-site. Very likely I’m planning to bookmark your site . You surely have incredible articles and reviews. With thanks for sharing with us your blog.